1944 DLC adds Battle of Itter an endless horror fight against zombies. Fight your way trough a horde to get out of the secret nazi base for zombie sience before the Great Gustav Railway cannon will blow the place to the ground! 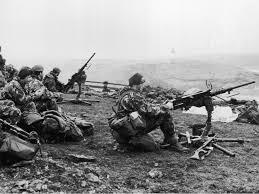 1 new weapon and 2 never seen battles at Greenland and Falkland island. The German headquarters moved to the north Greenland to reinforce their army, fight against hundreds of Allied forces in amazing battle. Falkland island has been invaded by the Argentinians to secure a safe passage for the last german uboats and ships to travel to Greenland. 10/10 - IGN "Would buy again"